If I am honest, it has been a while since I had a thoroughly enjoyable time on a motorcycle from start to finish. Don’t get me wrong, there is nothing better than going for a ride however the Street triple made riding enjoyable no matter where I was. Whether I was stuck in traffic, navigating our dodgy road network or even potting along at 40km/h, the Triumph made any riding environment entertaining. The last time I had this much fun was when I was on the 990 Duke or the Aprilia SXV450 or when I had a drunken girlfriend. When the younger generations amongst us think Triumph, we usually associate it with tweed, ale, roadside pubs, beards and grandpa. This is probably due to their traditional English image and bikes such as the Bonneville, Thruxton and the Scrambler (no not an MX bike). However any 18 year old loony wheelie nut head can climb aboard the Street Triple and raise their heart rate to dangerous new levels. I was thoroughly impressed with the entertainment factor of the Street triple, there was never a dull moment. The Streetrip, as I shall now call it, has an upmarket feel. Everywhere you look there is brushed aluminum and tasteful fairings finished in an attractive paint scheme. 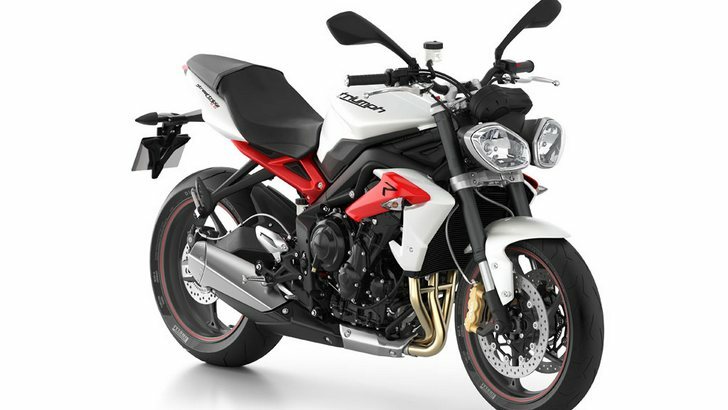 The design is enticing for a naked and Triumph have also included subtle built in ‘crash bobbins’ (see image below). I am actually surprised manufacturers haven’t included this in their designs long ago, (perhaps it’s all the money they make when they have to resell you a set of plastics, levers, and rearsets after you’ve binned it). The Streetrip also possesses excellent ergonomics, a comfortable riding position and very responsive riding traits. The wide handle bars make changing directions instantaneous. The brakes are super sharp and ABS will keep you straight and true over slippery surfaces. However you do feel the ABS working through the brakes, more so the foot brake. What is really impressive about the Streetrip however is the power delivery. There is amazing low down and mid-range grunt. Whilst in 6th gear you can easily roll on the throttle from 40km/h and off you go. This is what makes the Streetrip so attractive to me. Although it has a capacity of 675cc, a 100kg rider only needs to utilize the low down torque and you are already up to speed. In fact it is a little like a 3 litre diesel BMW. You never have to over-rev it to get going. Except with the Streetrip there is no turbo lag. This is what separates the Streetrip from other 600cc sport bikes where the power is all at 19 000 000 revolutions per second. Witches have been known to cower away in the dark when they hear the scream of a Yamaha R6 approaching. In fact an R6 came past me the other day with an aftermarket slip-on. I thought the doomsday prophecy had come to life. Once I had my ears stitched back on I returned to the comfort of the Streetrip which sounds excellent. Even with the standard pipe there is a beautiful rasp, iconic of Triumphs today. Roll open the throttle and the exhaust barks as it becomes louder, much the same as a Ferrari 430 when the exhaust valves open. I am a huge fan of the Streetrip as an everyday bike. It’s comfortable, quick, economical and for plus minus R90 000. You can have one licensed and on the road. That is excellent value for money. No it won’t beat that 600cc howler around the track, you may need a Daytona for that, but at the same time you won’t need your spine fused after a ride to your mates place. Well there is a slight vibration that appears as you approach and exceed the 12 000 rpm range (which your girlfriend will enjoy), top end is not stratospheric and there is little in the way of electronic riding aids (besides the ABS option). So if you are looking for an everyday bike capable of taking you to work on a Monday and through the twisties on Sunday, this is it. You are guaranteed to smile, that I promise you.